As sweet as cinnamon: Blog Hop Fun! Thank you for joining Our Craft Forum’s blog hop. for like minded people who love crafts. Mostly patchwork, stitching, quilting and the like. & to join in on swaps of all types. The blog hop starts at miss~nances blog so if you want to join us on the whole journey please go to Miss Nances Life and follow the links at the bottom of each post to find the next blog along the way. Each person who joins our forum from this blog hop will go in the draw for a craft pack. So to join our forum, please go to http://ourcraftforum.freeforums.org/ and register. Entries close at MIDNIGHT EDST (Sydney time) Sunday 27 February. after a friend introduced me. of chatting to like minded crafters. a few more of the forum ladies. We painted and decorated and got into the swing of things..
Why not join us if you have a spare hour or so. We all love it one way or another. from Fat Quarter shop today for my Giveaway! we'll go across some miles and visit another country. Have a visit and see what Celine is up too. Lovely fabric Dawn, and what a pretty blog! Great giveaway Dawn, I hope someone who really needs it will win. Great fun and also a way to become a follower. Love your giveaway. Lovely choice Dawn. I alsways enjoy reading your blog. Before I joined the forum I didn't realise blogs were so informative and friendly. It so nice to meet you, Dawn. I have fun exploring your blog. I love seeing all the ideas and fun things that you do. Thanks for the chance to win your giveaway!! What a great idea this blog hop is, thank you for showing ur creations. That fabric is definitely Lovely!! Hi Dawn, Great giveaway, lovely fabric. OH Look! It's got Sandy written on it!!! LOL. Now that is some "lovely" fabric. I've joined the forum too. Wow, Lovely sure is lovely - just my cup of tea. Hope I win. Off to check out the next hop and to join your Forum (sounds like fun). I've joined the forum and have long been your follower. Having a great time hopping to meet everyone. There are some wonderful blogs out in cyberspace. I love it all! Dawn, love your blog and this charm pack is wonderful please enter me! Great giveaway, Dawn! Please count me in! I've been a follower for quite a while, but just joined the forum today. I'm looking forward to checking it out! I've signed up to the forum! Love blog hops, great way to meet new bloggers! I LOVE that range of fabric, thanks so much for the chance. Really enjoying this hop! I am having a fun time on the blog hop. Finding some new blogs as well as some I already follow. Wow am I finding lots of really kewl blogs! Thanks for hop! I do belong to the forum :) joined over a month ago! Love your giveaway also! Love the snowflake embroidery in your title picture! 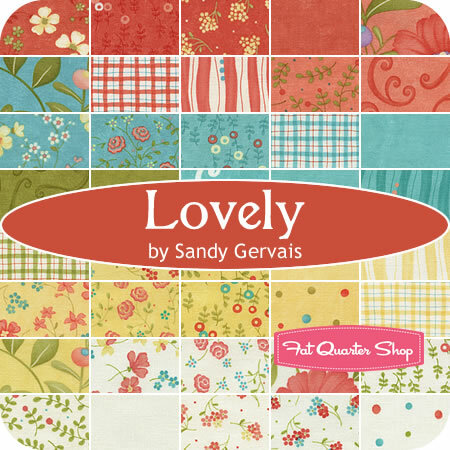 Sandy's fabric lines are always a winner :) I'm glad I follower your blog, Dawn, or I might not have heard about this hop or the forum. So far most of the blogs are new to me, and boy am I having fun! I did register for the forum and posted a little howdy. I posted an entry on the blog hop giveaway topic, too. Hi Dawn! Lovely blog, lovely fabric, lovely blog hop! Thanks for the inspiration! I'm now a follower of your blog and I joined the forum! thx! Hello, dropping by and leaving a comment this time though I do like looking at this blog quite a lot! He he, does that make me a silent (almost) follower? I have signed up for the forum and cannot wait until I have more time to look it over! Hi from another forum member, I'm enjoying reading some new blogs. I've been enjoying your blog along with the other gum nutters for some time now. Thank you for sharing your wonderful ideas. Hope you have a wonderful time catching up with the 'ladies' soon. Will have to have a catch up myself soon, see what you have all been up too! please enter me for the nice charm pack and also for registering on the forum. gotta keep hopping. I love blog hops.Thank you for the giveaway too. Dawn--lovely to hear you describe our new place, Enjoyed your blog as always. Hi,those are lovely fabrics.... I am beginner in quilting so would love to get some tutorials, patterns and advices so I have already joined craft forum. That was a great idea. The blog hop is a fantastic idea for getting the forum "out there"! Hello, lovely fabric Dawn. I have just joined the forum and I am jumping from blog to blog. How lovely is that Lovely fabric. Beautiful fabric! This blog hop is great fun. Have a terrific day. Oh my goodness, that fabric is lovely! :) You have such a beautiful blog, I always enjoy 'visiting' with you. Lovely! fabric choice LOL Thank you! I am so excited about the blog hop. I was just getting ready to post a picture of block two in your block of the month. I love the charm pack you have chosen for your giveaway. What I could make with such a "Lovely" charm pack is only limited by my imagination and I have a very vivid one LOL.Loving the blog hop :) Barb. I have become a regular visitor to your blog. I have just finished making your beautiful doiley made from 5 charm squares, and I am waiting for a charm square pack to arrive so I can start 'Frosty Flakes'. I love using hexagons - I find them very relaxing. I have joined the forum and I am having alot of fun taking part in the blog hop. I hope you are having fun too! am loving hopping through many lovely blogs, :D there are SO many things to see! Hi Dawn, I found the forum by following your blog and I joined today. Love the fabric, thanks for the chance to win. It is always a treat to drop in on your blog and see all your lovely creations.